So, I'm working with HP-sauce this week, and was one of the bloggers asked to contribute a recipe. (That will be published on their Swedish Facebook page, and possibly used in a recipe folder.) I was a little stumped at first, since I actually don't eat a whole lot of HP-sauce. I do use it in marinades, as it's so perfect for barbecuing, but I suspected many others would choose red meat as their main protein and I wanted something a little different. And then I came up with a salad. 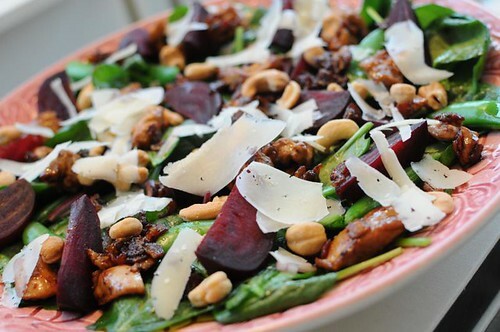 A really hearty salad, with chicken marinated and glazed with the HP-sauce, bacon, beetroots, spinach, manchego cheese and cashew nuts. All good stuff. And so, so delicious. Really. This is one to try. Start by cutting the chicken into dice, and marinated in the HP-sauce for at least one hour. Cook the beets in salted water - leave the root and tip, to prevent "bleeding". The time will depend entirely on the size, so make sure to check that they're cooked through. Small ones will take about 30 minutes, larger ones quite a while longer. When they're soft, cut off roots and tips, and peel. (Plastic gloves come in handy here.) Cut into wedges. Cut the bacon into strips, and fry until crispy. Set aside, and pour out most of the bacon fat. Fry the chicken - with the sauce - in the remaining bacon fat. Do this on medium heat, and stir to prevent burning, as the sauce will easily burn. When the chciken is cooked through, add the bacon back to the pan and stir, to glaze it. Cook the sugar snap peas for 1-2 minutes in salted water. They should just about soften. Slice the red onion thinly. Make a dressing from the olive oil, white balsamic vinegar, salt, pepper and sugar. Toss with the spinach and the onion. Arrange on a large platter. Add the chicken and bacon, the beets and the sugar snap peas, and finally top it with cashew nuts and the manchego cheese. Serve with a good bread, and you're all set! Låter jättegott! Älskar rödbetor i sallader och de passar bra ihop med HP-sauce tycker jag.